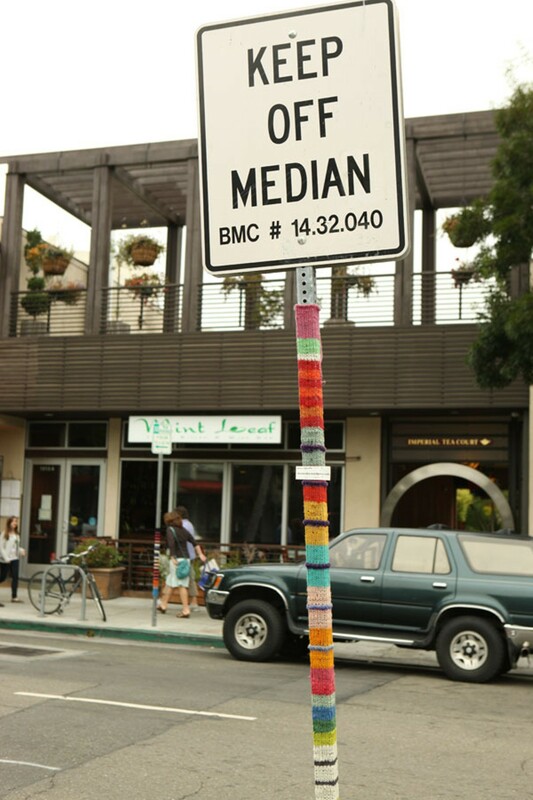 An anonymous knitter bombs the streets of Berkeley. Twelve years of sweater-making might lead the average knitter to burn out. It led Berkeley artist Streetcolor to completely revamp her operation — and re-conceive her identity in the process. Never content to be the stay-at-home crafter with a ball of yarn and a pair of knitting needles, she decided to take her work outside. It took a little planning, a couple recon missions, and the help of a young apprentice known as "The Russian." But pretty soon, Streetcolor was decorating the sidewalks and sign poles of Berkeley, foisting her work on an unsuspecting public. She's become one of several "graffiti knitters" who've launched their own form of urban beautification, by taking yarn to the streets. And you can see the results around town. A pole on the grassy median next to Cheeseboard Pizza bears thick stripes of color: deep crimson; hay-bale yellow, bronze-orange, spicy mustard, and bright baby blue. Atop sits a "Keep Off Median" sign. Go beyond Cheeseboard and you'll find plenty more: a thirty-minute parking sign decorated with fancy bobble stitches; stripey patterns adorning the poles outside Saul's Restaurant and Delicatessen; bright pastels at the nearby produce market. Streetcolor's art is "public" in every sense. It rests against newsstands, bicycles, and dogs that get tethered to poles. Last Tuesday morning one of her pieces made a flashy accessory for someone's black BMW, parked outside the Berkeley Rose Garden. Streetcolor won't reveal her real name, partly for fear of breaking cover, and partly — well, mostly — because she finds the alter ego enabling. "I've had a lot of ambivalence as an artist about how much ego was involved in art making," she said, during a surprisingly candid phone interview. She explained that since most art happens in the insular world of galleries and art studios, it's always concerned with presentation. With that comes a certain desire to please one's audience. "By making it anonymously and in street-art format, I could work just for the freedom and beauty of doing, it, and not feel like it was attached to who I was as a person." Add in the romance of being a sub rosa agent and it's easy to see why so many artists prefer working guerilla-style. Streetcolor approached her public art the same way she took to knitting in the late Nineties: obsessively. Capable of working in most media, she went whole hog into knitting right before it became a craze. "I took this book called Reader's Digest Knitter's Handbook and knitted my way through the whole thing," she recalled. By time she finished, Streetcolor had rendered herself a one-person cottage industry. She could add lace, make ruffles, crochet, weave multiple colors, and make any form of apparel from scarves to handbags to shrugs. "If you really like to knit and you knit a lot, you come up with an issue after several years that you don't even know what do with everything you're producing," Streetcolor said. "I spent years knitting garments, socks, bags." I stopped because I didn't want to make more things." 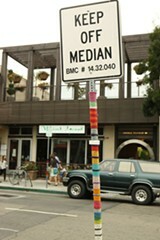 Then she came across Mandy Moore's 2009 guidebook, Yarn Bombing: The Art of Crochet and Knit Graffiti. The book documented a new phase in knitting as both an art form and subculture. By then, "bombing" had already become a commonplace verb in the knitting world. 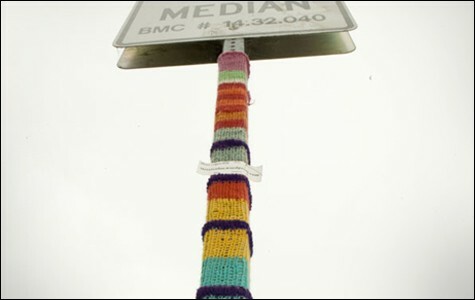 A Houston, Texas group called Knitta began adorning lampposts and telephone poles in 2005. Knitta spawned offshoots throughout the United States, including the band of rogue knitters who made a cozy for the "There" sign on Martin Luther King Jr. Way at Adeline Street. Knitting now had a decidedly urban cast. Streetcolor was hooked. She did a test run about ten weeks ago, installing a tiny piece outside her house with help from the Russian. Then they decided to start the project in earnest. They scouted three poles at Colusa Circle and made three long knit strips in less than twelve hours apiece (Streetcolor has a twelve-hour rule to limit herself from getting over-ambitious), all hand-spun on a drop spindle. They left the house at around 7 p.m. The streets were sparse, but there was still enough light for a project that required precision and manual dexterity. The two women sewed their installations around the three poles using a whip stitch (i.e., the crudest way to set something in place, with yarn and a needle). They bombed a sign outside Semifreddi's Bakery, another at Kensington Circus Pub, and another at the produce market across the street. Streetcolor took pictures and documented everything on her blog. She added a disclaimer: "There is a lot of excitement about the knitting on the 'There' sculpture in Berkeley. We are not 'those knitters.' We are other knitters." At first, the knitters were apprehensive. "I was afraid people would be really upset," Streetcolor said. "So we'd knit them and then we'd go out at night and sew them onto the poles." But the yarn was well-received. Or ignored, as it became another element of the Berkeley landscape — just like the Cheeseboard customers eating their pizza beneath that "Keep Off Median" sign. At the very least, it didn't provoke ire from city officials. Streetcolor has made more than forty pieces to date, and says that only four have been taken down. Over time, she got more enterprising. She began decking out the wraps with ruffles or other adornments. She crocheted extra layers on top. By hand-spinning and dying all the yarn, she got to invent new color schemes. Streetcolor often turns to fused glasswork as a muse, since the colors are richer and more vivid than in traditional yarn. She said she might have become a graffiti glass artist — except "you just can't carry that glass furnace like you can the knitting." As guerilla knitting grew in popularity, Streetcolor loosened up and allowed her operation to become increasingly transparent. She became more and more fixated on the "sculptural" aspect of outdoor knitting, in that the sign poles allow a soft textile to take on a rigid form. She began knitting, spinning, and dying for ten- or twelve-hour stretches every day, running her other art businesses on the side. She and the Russian developed a "blitz" style of infiltration, meaning they'd scout a location and mount several pieces at one time. They now work in broad daylight. And in the process, the Berkeley knitter has left her imprint all over Berkeley: by the Rose Garden, in the North Shattuck Gourmet Ghetto, on a pole outside Sotto Voce, throughout the Elmwood district, in front of Berkeley Natural Grocery, beside La Farine. She still considers herself a cloak-and-dagger artist — albeit one who also serves as a community benefactor. Streetcolor prefers to work outside her favorite local businesses. She favors bakeries, delicatessens, good pizzerias, and places with nice flower arrangements and art on the walls. She sometimes advertises the mousse tarts or opera cake on her web site. And, despite the avatar, she isn't completely anonymous. Every piece bears the "Streetcolor" imprimatur in the form of a business card. "Leave a comment at Streetcolor.wordpress.com," they all say. Perhaps it's a little less guerilla when you add the url.